It's her world, you're just eating it. All photos by Pavia Rosati. 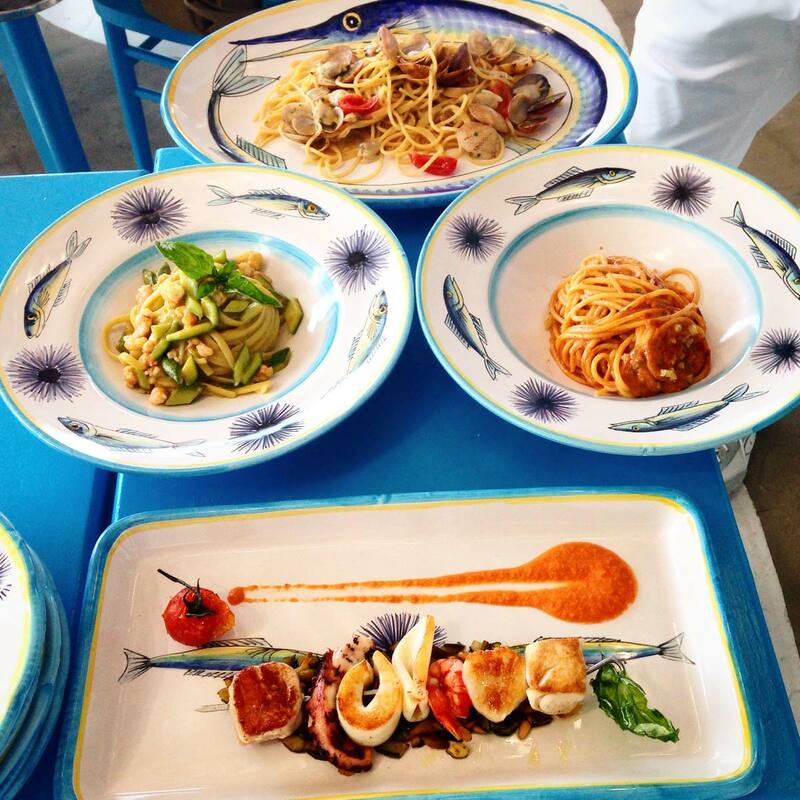 Popupla's Pavia Rosati had the perfect Amalfi Coast lunch planned. And then the weather decided to get in the way. 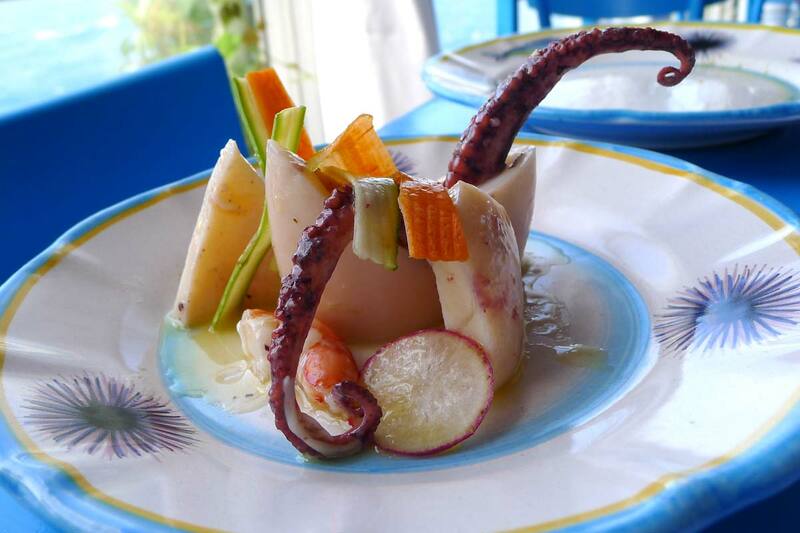 ANACAPRI, Italy – You know what the gods say about your best-laid plans, right? The gods laugh at your best-laid plans. And everyone knows that the gods especially love to laugh at your best-laid plans on vacation. It all began innocently enough, over drinks with my Italophile pal, travel writer Maria Schollenbarger. "It's only the most glamorous lunch ever," she said. "How have you never been?" She was talking about , the beach club of the truly, ridiculously glamorous in Anacapri along the less populated northwestern coast of Capri. A lunch way more insidery than the drippingly cool La Fontelina in Marina Piccola. And she was surprised because I spend a few weeks every summer in this part of the world, where I devote most of my days to having overly-long lunches in the sunshine. But "this part of the world" actually means the other side of the Bay of Naples at Lo Scoglio, the seaside hotel and restaurant on the Sorrentine Peninsula that holds me like an all-too-happy captive from the moment I land at the Naples airport. Although as the crow flies, the distances are small, when you're relying on ferries, taxis, and winding roads, it can take two hours to cover twenty kilometers on the Amalfi Coast. So, no, I had never been to Il Riccio. I'd get there one day. Who wouldn't go out of their way for this? A buzzy, beachy dining room. Sun beds on the cliffs. Last season, however, I decided that my husband Ben and I would delay our arrival at Lo Scoglio and spend a couple of days exploring Ischia, the island just north of Capri. When our friends Mark and Sharon told us that they were detouring to Capri before meeting us at Lo Scoglio, I hatched part two of my grand master travel plan. 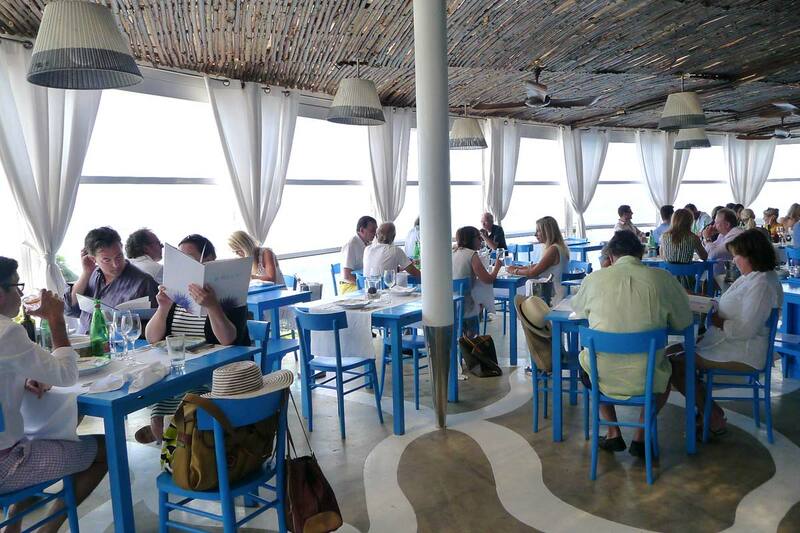 Really, it was too perfect: Ben and I would leave Ischia in the morning, hop the ferry to Capri, catch a taxi to Capri Palace for an aperitivo and to see their new art installations, and finally meet Mark and Sharon for a seaside lunch at Il Riccio. 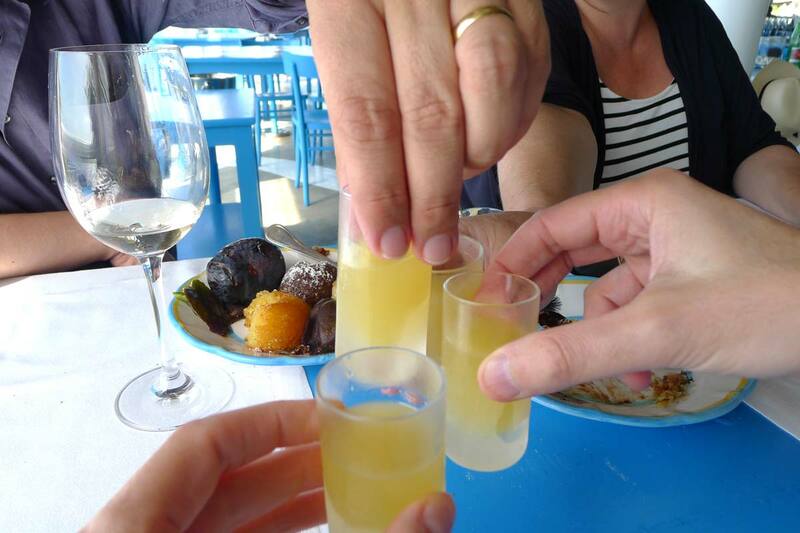 At the end of lunch, when we were supremely boozy, fat, and happy, Guiseppe Masticiello, our trusty sailor and friend, would pick us up in his wooden sailboat at the restaurant's dock and deliver us to Lo Scoglio. No ferries, no highways, no schedules. Just a big blue sea in the late afternoon sun and a well-earned buzz from all those bottles of crisp white wine. Heaven, in other words. Ben and I have dreamed of arriving at Lo Scoglio by boat for so many years, and here was the ideal chance to do it. Double heaven, come to think of it. This is the point in the story when I can probably stop typing because you'll know what's coming: It went nothing like this. The morning we were set to leave was bright, sunny, and beautiful. We arrived at the port with plenty of time to spare. Clever me had even bought our Ischia-Capri ferry tickets the night before. Only something wasn't right. There was no ferry at bay #3. I sprinted to the ticket office and pushed my way through the long lines (Italians don't wait; they shove) until a short man behind a glass told me there was no ferry. "C'e' mare," came the reply. Which translates as "there's sea," but which really means "the seas are rough." "Too rough for a ferry?" I asked. Seriously. What's a little wind ? There was no reply, because Mr. Shorty didn't care about my best-laid plans. Because he lives here and know that when you're on the Amalfi Coast, the weather has a mind of its own and doesn't care what's on your mind. So Ben and I had to scramble and decide: abandon the lunch plan and go straight from Ischia to Naples into a car to Lo Scoglio or stick to the plan and make it to Capri? 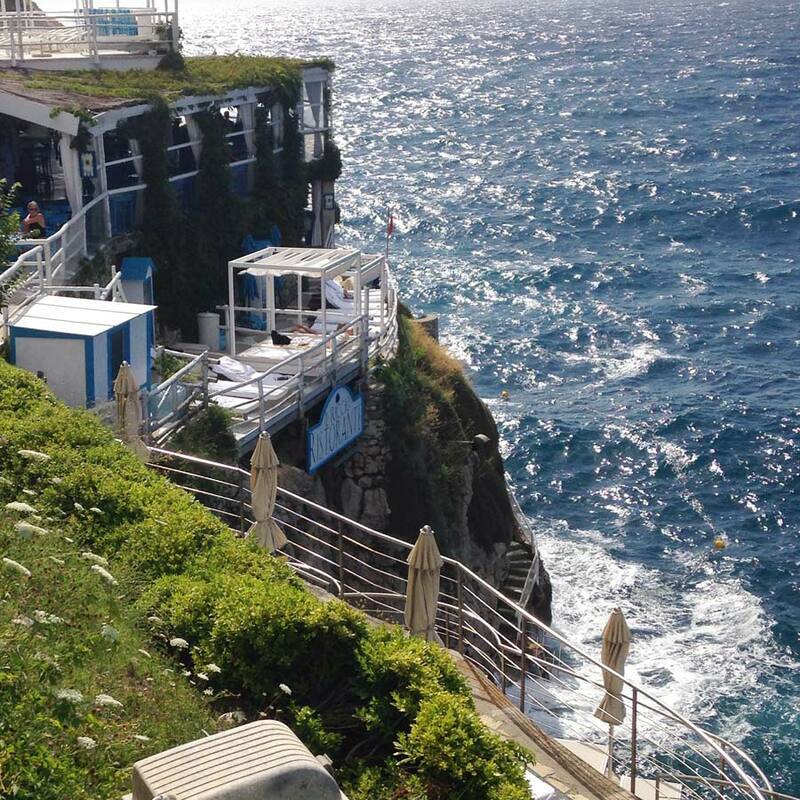 The smart move was to go directly to Lo Scoglio and skip Capri. It's lunch, and you can always have lunch another day. Ben and Pavia in the Capri taxi. Which of course is not the choice we made. And so the next few hours involved a variation of planes, trains, and automobiles, starting with the slow ferry from Ischia to Naples (which took 90 minutes instead of 30), a journey notable for the waves that crashed against the second-floor windows and for its 200 seasick passengers, and then another slow ferry from Naples to Capri, which was also depressingly longer than it should have been. 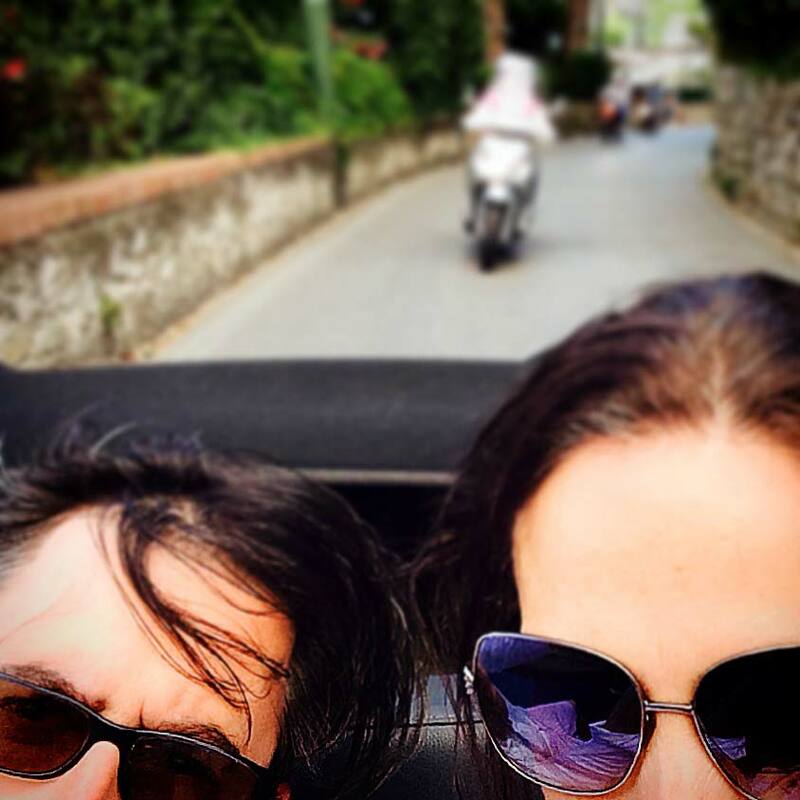 From Capri, we tore through the island in the back seat of a zippy convertible taxi. (At this point, we were an hour late for our reservation.) Mark and Sharon were waiting for us on lounge chairs at Il Riccio, the only people outside on the deck. "C'e' mare" usually also means that "c'e' vento," and this day was no exception: It was too damn windy to lie out at this glamorous beach club. All those sun beds scattered along the cliff plunging down to the sea — empty and wasted. 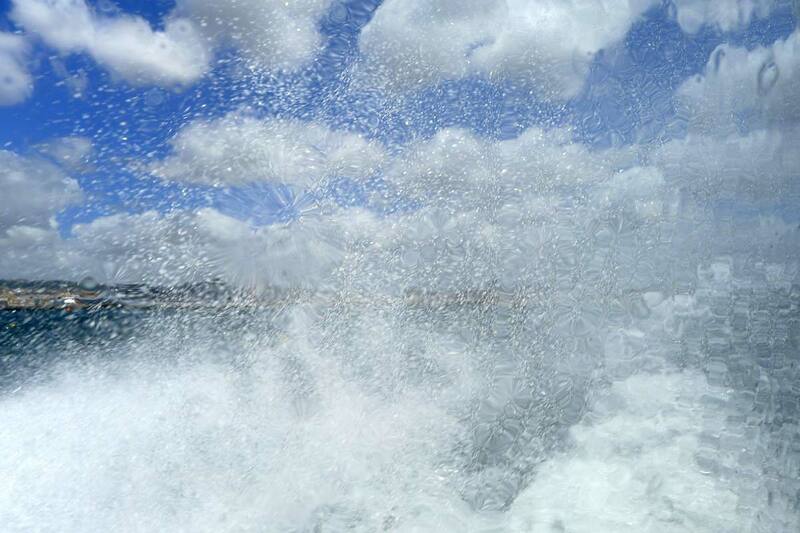 Still, wind may wreak havoc on your sunbathing, but it can't do anything to your lunch eating. 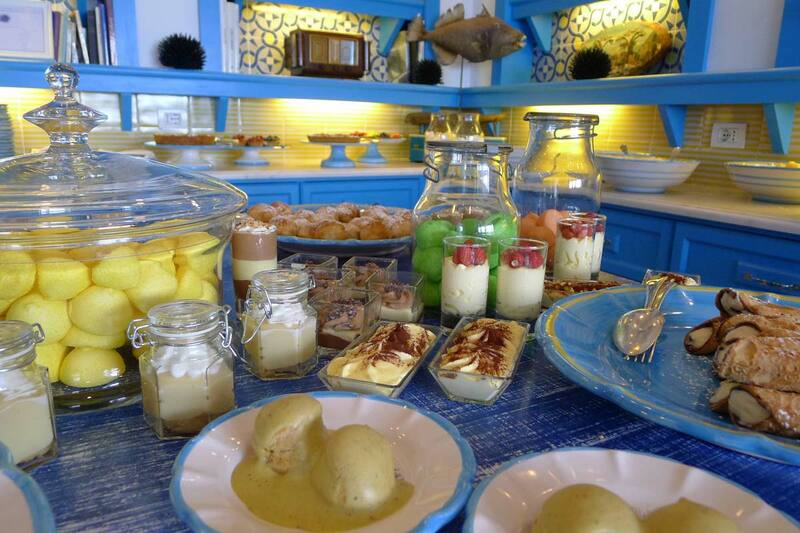 And so we sat down at our bright blue table by the window and settled into our feast. The long procession of courses began. Delicate caponata so good we ordered seconds, fresh anchovies, artful octopus, fried gamberi, ravioli with fresh tomato sauce, linguini with shrimp and zucchini, whole fish roasted in a pastry crust. 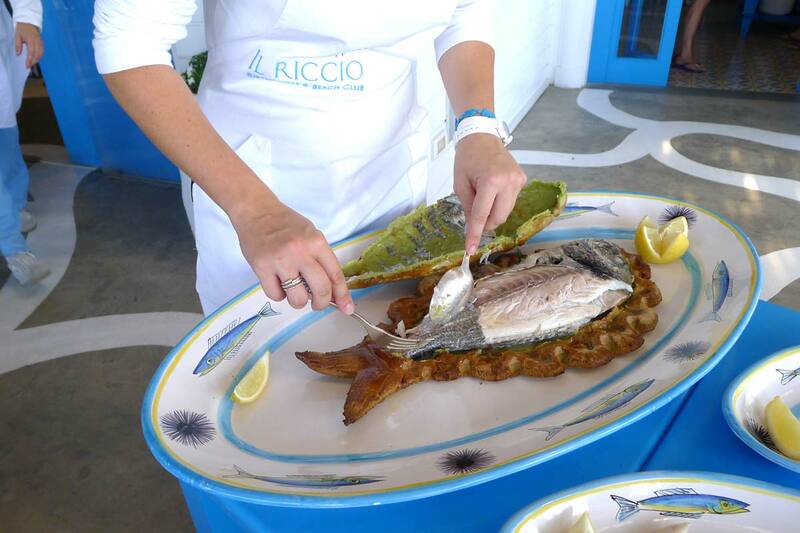 Everything was served on ceramic plates painted with cute fish and sea urchin ("riccio" means "urchin"). 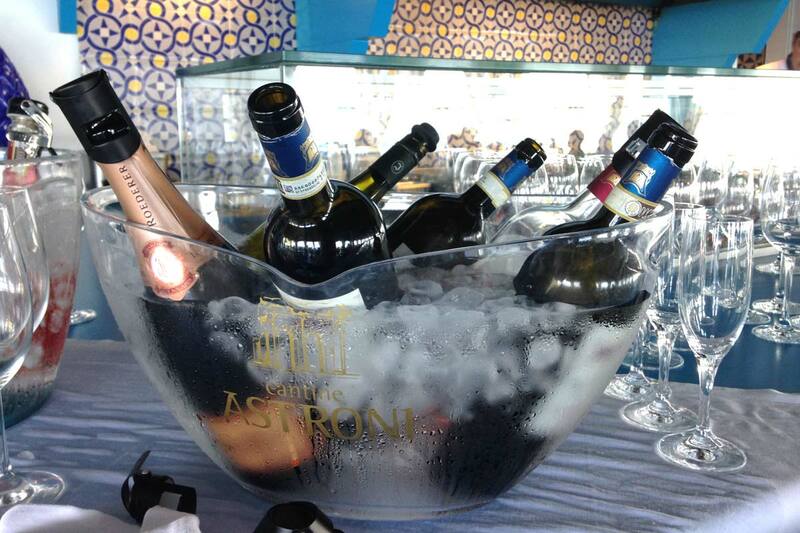 Our glasses were never empty — Roederer champagne, falanghina, and limoncello flowed freely. And now for the food, starting with octopus. 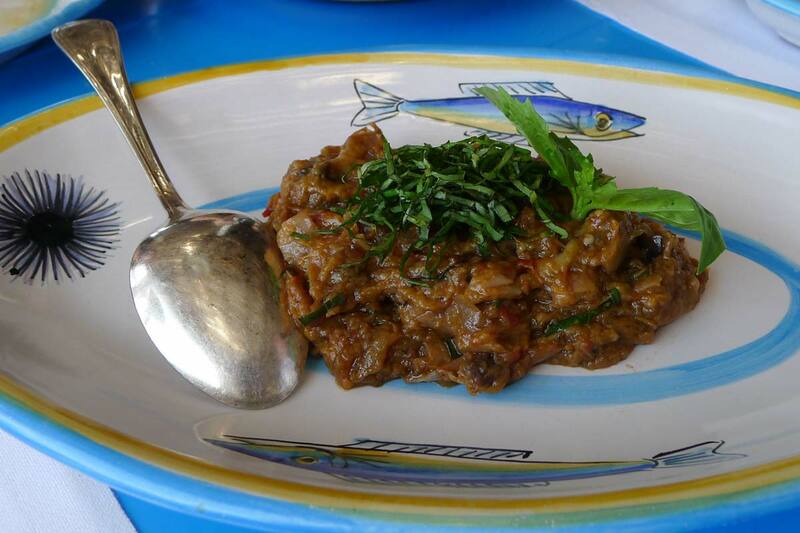 A double order of caponata. 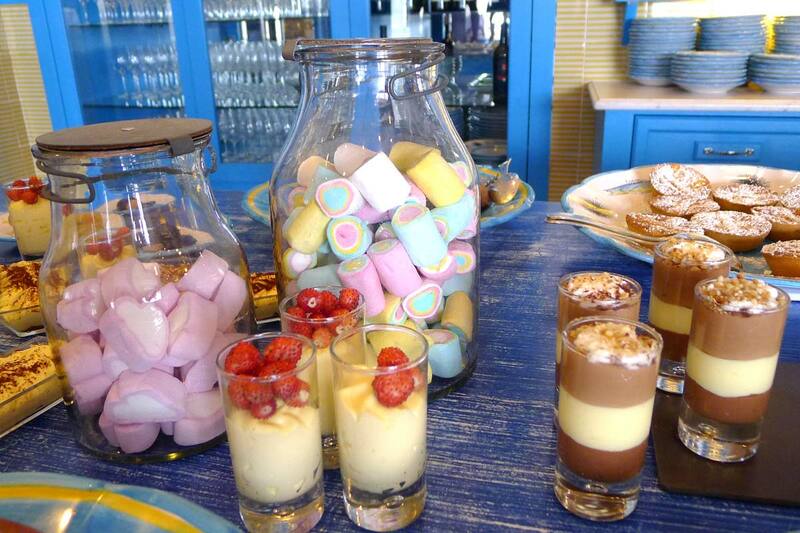 Help yourself. No one is counting the cannoli. Dessert was its own elaborate exercise — although "exercise" is an hilariously inappropriate word for an entire room filled with pastries, sweets, cannoli, fruits, and chocolate concoctions. 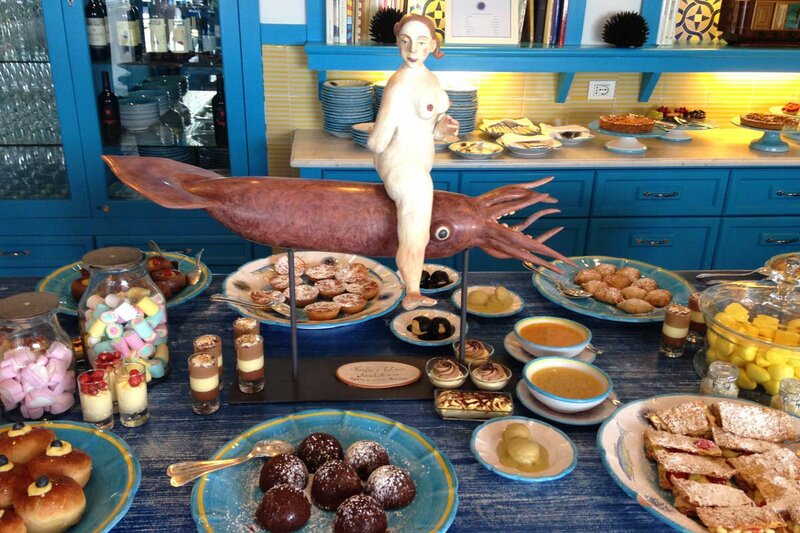 Lording over the cornucopia was a sculpture in the middle of the table of a plump sea nymph riding an octopus. It's her world, people; you're just along for the ride. The dining room was buzzy and animated, though clearly it wasn't half the scene it would have been on an easy, sunny day when half the diners arrived by boat. The meal was delicious, worthy of its Michelin star, and the setting was splendid. This was an outstanding way to spend the day. Yes, even though I couldn't drink my afternoon espresso on a day bed on the cliff. I kept texting Giuseppe every 20 minutes to see if the seas had calmed enough for him to come get us by boat. (Because I'm stubborn and hope springs eternal, that's why.) 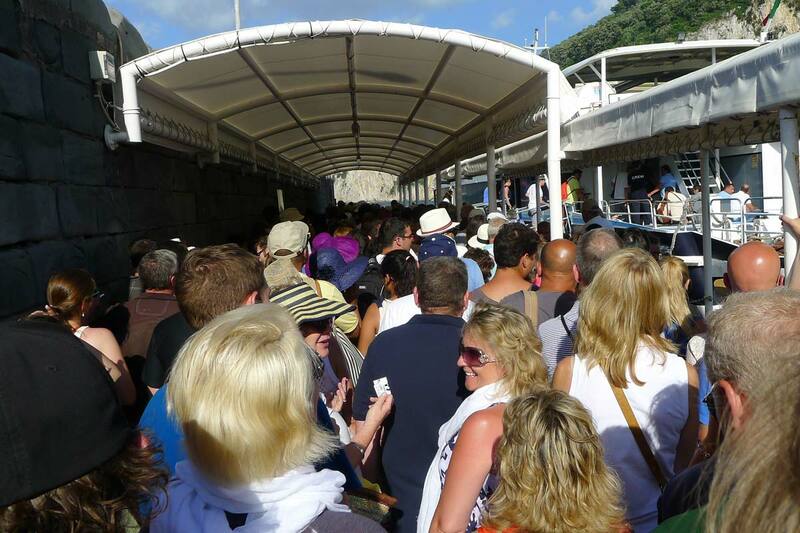 They hadn't, so it was back to the marina for us and onto the crowded ferry to Sorrento with the rest of the day-tripping sardines packed onto the upper deck. So much for my most glamorous lunch ever, which in the end was just a most adventurous lunch ever (if it was even that). But we had another week on the Amalfi Coast, and things were looking sunny.